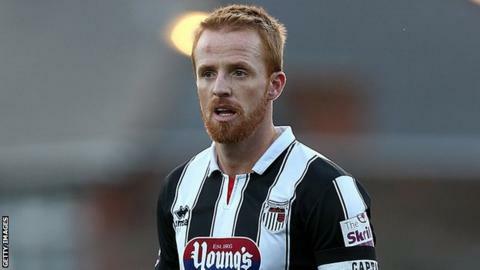 Grimsby's Conference title hopes suffered a setback despite an injury-time equaliser against Gateshead. Craig Disley headed in Jack Mackreth's cross to earn a point for the hosts who sit three points behind leaders Barnet. Kevin Sainte-Luce fired in to put the visitors ahead before Mackreth levelled from 20 yards after the break. Sainte-Luce powered home his second and Grimsby's Valentin Gjokaj was then dismissed for a second yellow card but Disley still had time to rescue a draw. The Mariners, who are now unbeaten in nine league games, remain in third place while Gateshead drop to 10th, six points behind a play-off spot. "It was an exciting game. We wanted to win the game and Barnet have managed to get the victory, as expected in truth, so we have fallen a little bit behind, but in truth I don't think the fans can ask for much more from the team. "I thought they showed great character and played some good stuff. For me, it's a good point in respect of it means we stay unbeaten. "There's no way in this world that we didn't deserve to get anything from the game and it was great to get such a good atmosphere in the ground. "Again it was a good response and realistically they've hardly had an attempt at goal. We were the ones pushing and threatening." Match ends, Grimsby Town 2, Gateshead 2. Second Half ends, Grimsby Town 2, Gateshead 2. Substitution, Gateshead. Jake Orrell replaces Adam Campbell because of an injury. Goal! Grimsby Town 2, Gateshead 2. Craig Disley (Grimsby Town) header from the centre of the box to the top right corner. Assisted by Jack Mackreth with a cross. Joel Dixon (Gateshead) wins a free kick. Second yellow card to Valentin Gjokaj (Gateshead) for a bad foul. Attempt missed. Ollie Palmer (Grimsby Town) right footed shot from the left side of the box is too high. Substitution, Grimsby Town. Jordan Chapell replaces Shaun Pearson. Attempt missed. Michael Rankine (Gateshead) right footed shot from outside the box misses to the right from a direct free kick. Substitution, Grimsby Town. Jon-Paul Pittman replaces Lenell John-Lewis. Substitution, Grimsby Town. Christian Jolley replaces Nathan Arnold. Gregor Robertson (Grimsby Town) is shown the yellow card for a bad foul. Attempt blocked. Carl Magnay (Grimsby Town) right footed shot from outside the box is blocked. Attempt saved. Jack Mackreth (Grimsby Town) right footed shot from the right side of the box is saved. Goal! Grimsby Town 1, Gateshead 2. Kevin Sainte-Luce (Gateshead) right footed shot from the centre of the box to the bottom right corner. Attempt saved. Gregor Robertson (Grimsby Town) left footed shot from outside the box is saved. Attempt saved. Lenell John-Lewis (Grimsby Town) header from the centre of the box is saved. Assisted by Jack Mackreth with a cross. Adam Campbell (Gateshead) wins a free kick. Attempt missed. Lenell John-Lewis (Grimsby Town) right footed shot from the centre of the box is too high. Assisted by Craig Disley with a cross. Substitution, Gateshead. Adam Campbell replaces Rob Ramshaw. Attempt missed. Ollie Palmer (Grimsby Town) header from the centre of the box is too high. Assisted by Carl Magnay with a cross.